Saint Petersburg (Russian: Sankt-Peterburg) is a city and a federal subject located in the Northwestern Federal District of Russia on the Neva River at the east end of the Gulf of Finland on the Baltic Sea. 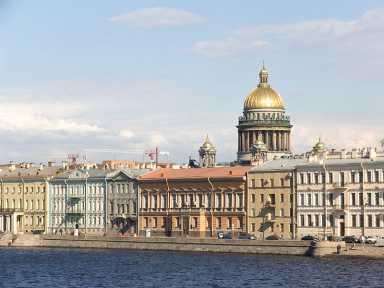 St. Petersburg's informal name, Piter, is based on how Peter the Great was called by foreigners. The city's other names were Petrograd (1914-1924) and Leningrad (1924-1991). Founded by Tsar Peter the Great on May 27, 1703, it was capital of the Russian Empire for more than two hundred years (1712-1728, 1732-1918). St. Petersburg ceased being the capital in 1918 after the Russian Revolution of 1917. It is Russia's second largest and Europe's fourth largest city (by city limit) after Moscow, London and Paris. At latitude 59°56'N, Saint Petersburg is the world's largest city north of Moscow (55°45'N). 4.6 million people live in the city, and over 6 million people live in the city's vicinity. Saint Petersburg is a major European cultural center, and important Russian port on the Baltic Sea. The city, as federal subject, has a total area of 1,439 square kilometres (556 sq mi). St. Petersburg enjoys the image of being the most Western European styled city of Russia. Among cities of the world with over one million people, Saint Petersburg is the northernmost. Russia's political and cultural center for 200 years, the city is impressive, and is sometimes referred to in Russia as "the Northern Capital" (severnaya stolitsa). Saint Petersburg in 1903On May 1, 1703 Peter the Great took the Swedish fortress of Nyenskans and the city Nyen on the Neva river. On May 27, 1703 (May 16, Old Style) he founded Saint Petersburg after reconquering the Ingrian land from Sweden in the Great Northern War. He named the city after his patron saint, the apostle Saint Peter. The original name Sankt Pieterburg (pronounced Sankt Piterburh) was borrowed from Dutch (Modern Dutch Sint Petersburg), because Peter had lived and studied in the Netherlands; he also spent three months in Britain and was influenced by his experience in the rest of Europe. The city was built under adverse weather and geographical conditions. High mortality rate required a constant supply of workers. Peter ordered a yearly conscription of 40,000 serfs, one conscript for every nine to 16 households. Conscripts had to provide their own tools and food for the journey of hundreds of kilometres, on foot, in gangs, often escorted by military guards and shackled to prevent desertion. Many escaped, however, and others died from disease and exposure under the harsh conditions. The new city's first building was the Peter and Paul Fortress, it originally also bore the name of Sankt Pieterburg. It was laid down on Zaiachiy (Hare's) Island, just off the right bank of the Neva, three miles (5 km) inland from the gulf. The marshland was drained and the city spread outward from the fortress under the supervision of German and Dutch engineers whom Peter had invited to Russia. 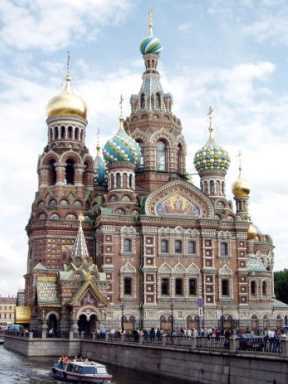 Peter restricted the construction of stone buildings in all of Russia outside of St.
Petersburg, so that all stonemasons would come to help build the new city. At the same time, Peter hired a large number of engineers, architects, shipbuilders, scientists and businessmen from all countries of Europe. Substantial immigration of educated professionals eventually turned St. Petersburg into a much more cosmopolitan city than Moscow and the rest of Russia. Peter's efforts to push for modernization in Moscow and the rest of Russia were completely misunderstood by the old-fashioned Russian nobility and eventually failed. This resulted in considerable opposition, including several attempts on his life and a treason case involving his own son. Peter moved the capital from Moscow to St. Petersburg in 1712, nine years before the Treaty of Nystad. It was a seaport and also a base for Peter's navy, protected by the fortress of Kronstadt. The first person to build a home in St. Petersburg was Cornelis Cruys, commander of the Baltic Fleet. Inspired by Venice and Amsterdam, Peter the Great proposed boats and coracles as means of transport in his city of canals. Initially there were only 12 permanent bridges over smaller waterways, while the Bolshaya Neva was crossed by boats in the summertime and by foot or horse carriages during winter. A pontoon bridge over the Neva was built every summer. Today there are more than 800 bridges. Peter was impressed by Versailles and other palaces in Western Europe. His official palace of a comparable importance in Peterhof was the first suburban palace permanently used by the tsar as the primary official residence and the place for official receptions and state balls. The waterfront palace, Monplaisir, and the Great Peterhof Palace were built between 1714 and 1725. In 1716, Prussia's King presented a gift to Tsar Peter: the Amber Room. Aleksandr Danilovich Menshikov, Peter's best friend, was the first Governor General of Saint Petersburg Governorate in 1703-1727. In 1724 St. Petersburg Academy of Sciences was established in the city. After the death of Peter the Great, Menshikov was arrested and exiled to Siberia. In 1728 Peter II of Russia moved the capital back to Moscow. But four years later in 1732, St. Petersburg again became the capital of Russia and remained the seat of the government for about two centuries. St. Petersburg prospered under the rule of two of the most powerful women in Russian history. Peter's daughter, Empress Elizabeth, reigned from 1740 to 1762, without a single execution in 22 years. She cut taxes, downsized government and was known for masquerades and festivities, amassing a wardrobe of about 12,000 dresses, most of them now preserved as museum art pieces. She supported the Russian Academy of Sciences and completed both the Winter Palace and the Summer Palace, which then became residencies of Empress Catherine the Great, who reigned for 34 years, from 1762 to 1796. Under her rule, which exemplified that of an enlightened despot, more palaces were built in St. Petersburg than in any other capital in the world. Several revolutions, uprisings, assassinations of Tsars, and power takeovers in St. Peterburg had shaped the course of history in Russia and influenced the world. In 1801, after the assassination of the Emperor Paul I, his son became the Emperor Alexander I. Alexander I ruled Russia during the Napoleonic Wars and expanded his Empire by acquisitions of Finland and part of Poland. His mysterious death in 1825 was marked by the Decembrist revolt, which was suppressed by the Emperor Nicholas I, who ordered execution of leaders and exiled hundreds of their followers to Siberia. Nicholas I then pushed for Russian nationalism by suppressing non-Russian nationalities and religions. Cultural revolution that followed after the Napoleonic wars, had further opened St. Petersburg up, in spite of repressions. The city's wealth and rapid growth had always attracted prominent intellectuals, scientists, writers and artists. St. Petersburg eventually gained international recognition as a gateway for trade and business, as well as a cosmopolitan cultural hub. The works of Aleksandr Pushkin, Nikolai Gogol, Ivan Turgenev, Fyodor Dostoyevsky and numerous others brought Russian literature to the world. Music, theatre and ballet became firmly established and gained international stature. The son of Tsar Nicholas I, Tsar Alexander II implemented the most challenging reforms undertaken in Russia since the reign of Peter the Great. The emancipation of the serfs (1861) caused the influx of large numbers of poor into the capital. Tenements were erected on the outskirts, and nascent industry sprang up, surpassing Moscow in population and industrial growth. By 1900, St. Petersburg had grown into one of the largest industrial hubs in Europe, an important international center of power, business and politics, and the 4th largest city in Europe. With the growth of industry, radical movements were also astir. Socialist organizations were responsible for the assassinations of many public figures, government officials, members of the royal family, and the Tsar himself. Tsar Alexander II was killed by a suicide bomber Ignacy Hryniewiecki in 1881, in a plot with connections to the family of Lenin and other revolutionaries. The Revolution of 1905 initiated here and spread rapidly into the provinces. During World War I, the name Sankt Peterburg was seen to be too German, so the city was renamed Petrograd. 1917 saw next stages of the Russian Revolution, and re-emergence of the Communist party led by Lenin, who declared "All power to the Soviets!" After the February Revolution, the Tsar Nicholas II was arrested and the Tsar's government was replaced by two opposing centres of political power: the "pro-democracy" Provisional government and the "pro-communist" Petrograd Soviet. Then the Provisional government was overthrown by the Bolsheviks in the October Revolution, causing the Russian Civil War. The city's proximity to anti-Soviet armies, forced communist leader Vladimir Lenin to move his government to Moscow on March 5, 1918. The move was disguised as temporary, but Moscow has remained the capital ever since. On January 24, 1924, three days after Lenin's death, Petrograd was renamed Leningrad. The Communist party's reason for renaming the city again was that Lenin had led the revolution. Deeper reasons existed at the level of political propaganda: Saint Petersburg had stood as the symbol of capitalist culture and the Tsarist empire, but the Soviet empire needed to destroy that. After the Civil War, and murder of the Tsar Nicholas II and his family, as well as millions of anti-Soviet people, the renaming to Leningrad was designed to destroy last hopes among the resistance, and show strong dictatorship of Lenin's communist party and the Soviet regime. St. Petersburg was devastated by Lenin's Red Terror then by Stalin's Great Purge in addition to crime and vandalism in the series of revolutions and wars. Between 1917 and 1930s, about two million people fled the city, including hundreds of thousands of educated intellectuals and aristocracy, who emigrated to Europe and America. At the same time many political, social and paramilitary groups had followed the communist government in their move to Moscow, as the benefits of capital status had left the city. In 1931 Leningrad administratively separated from Leningrad Oblast. In 1934 the popular governor of Leningrad, Kirov, was assassinated, because Stalin apparently became increasingly paranoid about Kirov's growth. The death of Kirov was used to ignite the Great Purge where supporters of Trotsky and other suspected "enemies of the Soviet state" were arrested. Then a series of "criminal" cases, known as the Leningrad Centre and Leningrad Affair, were fabricated and resulted in death sentences for many top leaders of Leningrad, and severe repressions of thousands of top officials and intellectuals. This page was retrieved and condensed from (http://en.wikipedia.org/wiki/Saint_Petersburg) see Wikipedia, the free encyclopedia, January 2008. The Hermitage complex as seen from across the Neva River.